We know Apple(s AAPL) sold 37 million iPhones during the fourth quarter of 2012, but a new report gives more fine-grain detail to sales of its top two models. The iPhone 5, which debuted in September, rose to become the best-selling smartphone in the world on the strength of 27.4 million units sold, or 13 percent of all shipments, according to Strategy Analytics’ Handset Country Share Tracker published on Wednesday. The year-old iPhone 4S was the second-most popular smartphone, with 17.4 million units sold. And both models beat out Samsung’s Galaxy S III juggernaut, which after five months of availability, sold 15.4 million units during the fourth quarter. While Apple investors continue to worry that the iPhone’s relatively smaller screen and higher price prevent it from attracting more customers, the iPhone seems to be having one of its best moments. Wednesday’s report follows a previous one from the same firm, published earlier this month, that found the iPhone was for the first time ever the best-selling mobile phone in the U.S. But what may be more interesting than the iPhone 5’s stats is the sustained popularity of the iPhone 4S, which was released in October 2011. These numbers serve as evidence that a significant chunk of Apple’s customers are more interested in a lower price — $99 with a two-year contract — than the absolute latest in tech and design Apple offers. You could also use it as an argument against Apple making a new model cheaper iPhone, since it essentially already has one in the 4S. For its part, Samsung is reportedly set to release its follow-up to the Galaxy S III, the Galaxy S IV, in March, so this picture may very well change over the next several quarters. Will there be a need for iPhone 4 cases and 30pin chargers a year from now? Based on this article, I would say yes. However, what is the average lifespan of the iPhone 4/4S? These are totally bogus numbers for iPhone 5. When in fact they aren’t accounting for iPhone 4 GIVE AWAYS…. that still make them the full price cost with carrier subsidies. iPhone 4 was FREE on contract and there was talk in January of it’s sales cutting into iPhone 5 Totals and why Apple reduced iPhone 5 parts orders. In fact they had plenty of iPhone 5’s in stock and were totally out of iPhone 4’s. So basically they used iPhone 4 to pad iPhone 5 sales so they could at least say it’s the single best selling model as if that makes up for the 83 Million differential of SAMSUNG Smartphones vs iPhones in the hands of consumers!!! Samsung = 220 Million Total Smartphones vs Apple’s 137 million total phones sold last year. 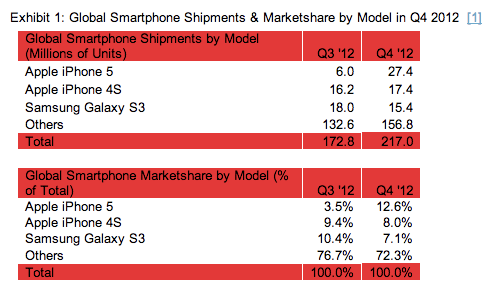 The differential is quite stark at 83 Million total on smartphones alone. If you throw in Feature Phones (which are used by people too), SAMSUNG out sold both Nokia and Apple by a huge margin….. and Samsung doesn’t even depend of their phone division in being the largest and #1 Global Electronics Conglomerate in the World by both sales Volume and Revenue! ….and why not explain why Apple lowered parts orders and Foxconn has ceased Recruitment of Chinese labor workers? ;-P ….REALITY = Apple’s not doing as well as this story portrays!!! 13.1 billion profit in the quarter. Hmm..